For those of us living in the northern hemisphere, winter is definitely here. With the shorter days, blustering winds, occasional snow, and sub-zero temperatures, this kind of climate calls for food of a heartier kind that warms both body and soul. So earlier this week, with that in mind, I made pot au feu, a traditional French beef stew and also the origin and inspiration behind the much loved Vietnamese phở noodle soups (also pronounced the same way). Not only is pot au feu hearty, but it lends itself well to communal eating as well… if you wish. 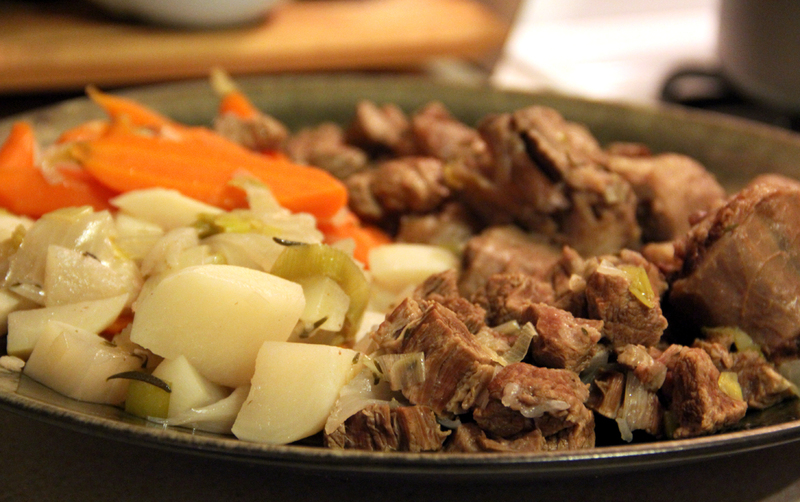 At its heart, pot au feu is made from stewing a combination of different cuts of meats and bone. It’s up to you what you use, there really isn’t a wrong way. Select both fatty and leaner cuts of meat, along with cartilaginous bone and you’ll have a great pot au feu on your hands. You’ll also be using seasonal root vegetables to round out your stew. Again, it’s up to you what you put in. I like the combination of carrots, turnip, and onions – potatoes and celery are also popular additions. The most labour-intensive part of this recipe is the pork, which I’d recommend making the night before you want to eat it. The longer you cook it, the softer and tastier the pork becomes. What’s great about this recipe is that it practically makes itself. All you need is a slow cooker or a thermal cooker. I use a thermal cooker for all my slow cooking and soups, which is probably one of my most highly recommended (and well-used) kitchen items I have. It keeps the heat, and cooks without requiring electricity or monitoring. More on the thermal cooker in a future post.